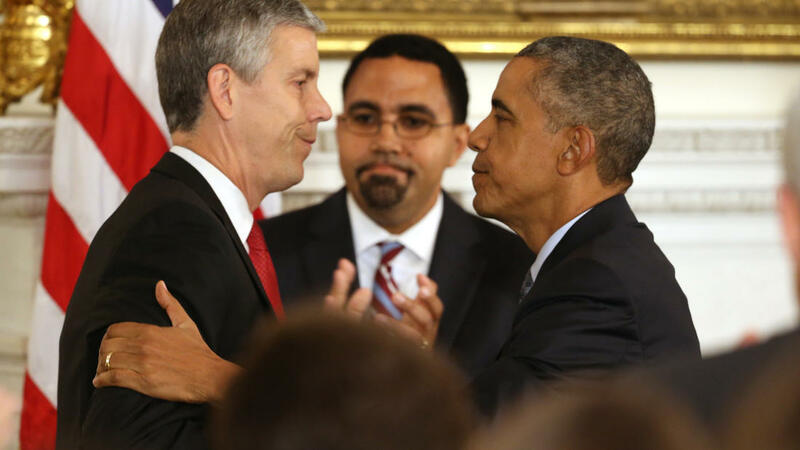 It appears Arne Duncan, US Secretary of Education, is stepping down. Duncan famously said Katrina was the best thing to happen to New Orleans because all the public schools were closed and replaced by charters run by his fabulously wealthy BFFs. He also said something about white soccer moms learning their children were not so smart after they were given Common Core tests for which they were not prepared. Arne was the choice of DFER, and thus the choice of the President of the United States, who threw Linda Darling-Hammond under the bus to accommodate their request. Who knows how many suitcases of cash it cost to buy Arne that gig? In any case, he doesn't want it anymore, and clearly has plans to whore himself out elsewhere. He can go give speeches to the Walmart family, or Eli Broad, or even for the great Bill Gates, who Common Cored the entire country. Well, not the entire country. After all, Bill's kids go to the same elite school he himself went to, and the ideas he sees fit to impose on our children are not quite good enough for his own. In an exhaustive search to find someone even worse, President Obama appears to have settled on thin-skinned, Reformy John King. You no doubt remember King for having mandated version one of the junk science evaluation system we all love so dearly. King famously had a listening tour on Common Core that he canceled when he found some New Yorkers dared disagree with him. He called parents and teachers "special interests," and indeed we are. Our special interest is the children of New York State, and it's unfortunate that King failed to share that interest with us. Like Duncan, he sends his kids to private schools where there is neither Common Core nor junk science teacher rating. King did such a terrible job in New York that people barely seem to notice how execrable his replacement, MaryEllen Elia, is. It's not easy to locate fanatical ideologues with absolutely no knowledge of or interest in research or practice, but both our state and national governments are up to the task. But the thing with reformies is this--you cut off one head and another just pops up right in its place. King will be an awful education secretary, even with his three years of teaching experience, one of which was in an actual public school. He will continue the corporatist hurtful policies embraced by Barack Obama, because really, you gotta admit they work for him. With a gig like this, he can continue to send his kids to elite Montessori schools while our kids do close reading and learn to hate just about everything about reading, school, and all that we value. Doubtless E4E, Families for Excellent Schools, DFER, and all the phony grassroots groups are having a field day as we meet the new boss, same as the old boss. They've clearly bought themselves the most profitable education system in these United States.